Most of what people collect represents historical events and social standards of the past. Smoking and its circle of collectibles represents evolution in advertising, design, packaging, societal norms, health expectations, and a host of other facets of the past century. Whether you collect one aspect or several, you’ll take a trip back in time to a world much different than the present day. There’s another, very practical reason, to collect smoking-related artifacts. They’re cheap and readily available. We have seen dealers with displays of ash trays, and we don’t recall seeing any of them over 10 or 15 dollars. For an even more economical start to your collection, you only have to go to a few garage sales to get aboard this collecting bandwagon. At yard and garage sales, you can almost vacuum up as many ash trays as your car can hold for a nominal cost. Among my ocean liner stuff, I have a good-sized collection of ash trays. Some are glass. Some are Bakelite. Some are metal. Others are china or porcelain. So before you start buying every ash tray at every garage sale, maybe you should decide on a focus. How about hotel ash trays, which you could complement with hotel matchbooks? Or the broader category of advertising ash trays? Or beer advertising ash trays? There are some very ‘period’ enamel ash trays advertising Labatts and other major breweries. Someone once dubbed the style as ‘early beer parlour’. 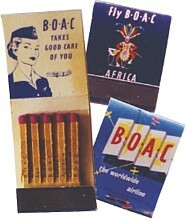 Old matchbooks from B.O.A.C. Airlines. Matchbooks? We know that matchbooks have been collected for a long time, and that they are getting harder to find. But they’re still out there. You might want to focus on transportation – trains, airlines, Canadian shipping, car dealers and repair garages – or some other generic topic that interests you. And don’t overlook the newer first cousin of the matchbook – the cigarette lighter. There are already lighter collectors out there, and you don’t want to be competing with an avid collector for a Dunhill or Cartier specimen. 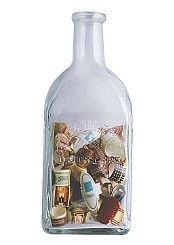 However, you can still build up a representative collection of lighters to take you down Memory Lane. Remember the first time that you saw a lighter with a clear barrel and the lighter fluid visible inside the barrel. Then a clever person inserted a fishing fly inside the barrel. I recall that at the time it was looked upon as a major triumph for modern science, and a very necessary accessory for the smoker who saw himself or herself as an outdoorsman. Find yourself a bottle and save your cigar bands. Cigarette containers themselves are a collectible – particularly the large tin ones that held 50 cigarettes – the ‘flat fifties’. They can be found at shows and sometimes at garage and yard sales, and the price shouldn’t break your bank account. They were very useful as containers for workshop accessories – I remember that my father used a couple for drill bits. The challenge is to find one in mint condition, but don’t’ hold out unrealistic hopes – any container used in a workshop suffered some degree of wear and tear. For the cigar smoker, the derivative collectibles were cigar boxes and cigar bands. Empty cigar boxes were useful for keeping all kinds of ‘stuff’ and many survived. Cigar bands were much more ephemeral, and since every smoker had his favourite brand, the ambitious collector had to have a broad range of cigar-smoking friends, or a readiness to pick up cigar bands from the street or other public source. 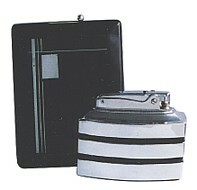 1940s cigarette case and lighter. Advertising is another category to collect. I love the signs encouraging the reader to smoke because it helped their love life, their tennis game, or some other significant personal objective. We know now that the implied benefits just weren’t there, but 50 or 60 or more years ago, there were no statistics to disprove those advertising claims or to conclusively support the adverse effects of smoking. 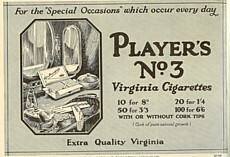 The tobacco companies were prolific in their production of gifts and novelties. A hundred years ago, you could amass a significant collection of pinbacks, with the name of the tobacco company on a paper insert in the inside of the pin. If you opt for collecting such pinbacks, don’t expect to find them very readily, although they are generally not expensive when you do find them – often within the ten dollar range. 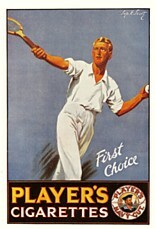 Perhaps the best known collectible through the years has been the cigarette card. Many people saved them during the 1920s, 30s, and 40s. I like the ones with ships or planes particularly with Canadian themes such as the Second War destroyer HMCS Saguenay . This series of cards is particularly fascinating as a marketing vehicle. Each card represented a particularly playing card, as in the illustration, a King of Clubs in this British Consols series. 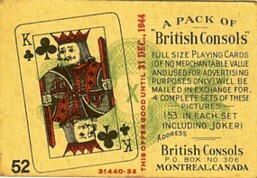 If you collected four ‘decks’ of these cards (53 cards per deck, including a Joker) and sent them in to the company’s offices in Montreal by the end of 1944, they would send you a full-size deck of playing cards. Fascinating. Do the math – with one card in each pack of cigarettes you would have to smoke 4x53= 212 packs of cigarettes – assuming that you were lucky enough to get a different card in each pack of cigarettes! You might decide that the most fun is looking for images of smoking as a social necessity – the apex of sophistication. 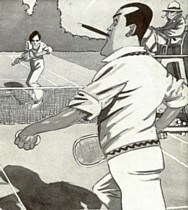 Packages of the 1920s referred to cigarettes as for the “Special Occasions” and a sketch of the era from a British magazine shows the smoker in triumph while his non-smoking opponent appears to be frustrated in his tennis efforts. If you had thoughts of being a postcard collector, you might think about specializing in Smoking Rooms. Designed to look like an exclusive club. the Smoking Room was the gentleman’s private domain – in all classes of travel. Illustrated is the Smoking Room on Canada’s RMS Royal George of the early 1900s.I speak from personal experience in being able to assert that you should be able to find at least a hundred different smoking room images, which could cost you in the range of 10 to 25 dollars each, depending upon scarcity and condition. Some have described the urge to collect as attributable to a ‘defective gene’. I think that it’s more a desire to recapture part of the past, and save it for the edification of future generations. In the case of smoking, it can trace the rise and fall of a popular vice, and the ability of advertising and promotion to popularize and validate that vice. However, now that we’re nearing the end of the smoking habit, we have to acknowledge that smoking generated some neat and desirable collectibles that reflect the style and habits of an earlier time, and now is the best time to begin your collection. John G. Sayers has collected ocean liner memorabilia for over 30 years. He is a member of the Board of The Ephemera Society of America, the Council of the British Ephemera Society, and the Executive of The Toronto Postcard Club. Mr. Sayers can be reached at jasayers@saybuck.com . All illustrations are from The Sayers Collection.